Membership demonstrates that your institution is committed to students. More importantly, membership in Delta Epsilon Tau will bring honor and earned recognition to those individuals who have worked diligently to acquire new knowledge and skills from an accredited distance learning institution. The fact that an individual is elected to membership sets her or him apart from other students and clearly demonstrates a serious commitment to distance education and self-study. 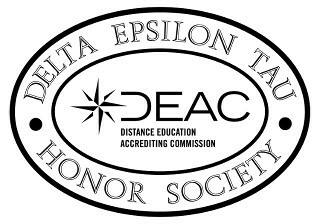 Delta Epsilon Tau (DET) places Chapters in those institutions recognized by the Distance Education Accrediting Commission. Application Process - Institutions should submit a Charter Application and one-time Charter fee to join. Once approved, each institution receives its own Charter and Greek Chapter name. This Charter will be mounted on a plaque and ready for display. The Charter—which is issued to the administration, faculty, staff, and students—includes the name of the institution, Charter date, and the official Greek name of the Chapter. To select candidates, each Chapter may choose to form a selection committee. This committee could include the President, Director of Education, Academic Dean, faculty representatives, one or two alumni members, and if possible, a state official. Although institutional grading systems vary, society candidates should generally have marks of "A" or rank at the top of their graduating class. As most institutions and programs are dramatically unique, each Chapter's selection committee can determine its own basic selection criteria. The criteria must be submitted in writing to the Delta Epsilon Tau Honor Society. Each inductee must sign an honor code and publicity release form. This code documents that the student: completed his or her own work and maintained over the minimum qualifying grade point average (as determined by each Chapter). The membership fee can be collected from each student or sponsored by the institution. The base charge for each individual membership is $45. DET Honor Cords are $15 each. There are no annual dues for schools or members. Student Sponsored — Most honor society memberships are student-sponsored. When students sponsor their own memberships, institutions simply send potential candidates an invitation and membership application (provided by Delta Epsilon Tau). Institutions encourage students to mail their applications and fees directly to the Delta Epsilon Tau Honor Society. Within a few weeks, all DET Honors are mailed directly to each outstanding student. Approximately every two months, each institution receives a complete report (listing the students that joined their respective Chapters).